UKG abbreviated Teacher Competency Test is a test to measure the activities of basic competence on the field of study ( subject matter ) and pedagogic in the domain of content Teachers. Basic competence fields of study were tested in accordance with the certification field of study ( for teachers who are already certified educators ) and in accordance with the academic qualifications of teachers ( for teachers who are not certified educator ) . Tested pedagogical competence is the integration of pedagogical concepts into the learning process of the subject areas in the classroom. 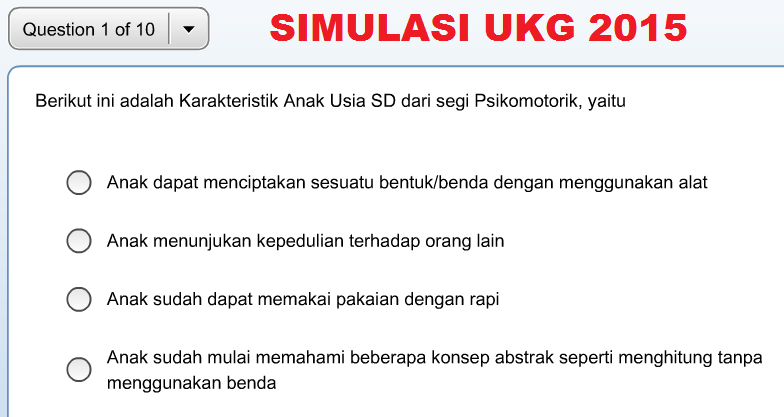 for colleagues who want to follow the Master Teacher Competency Exam Test ( UKG ) in 2015 , maybe this post can help you in your success in doing tests UKG 2015 schedule can be viewed through the website Sergur . 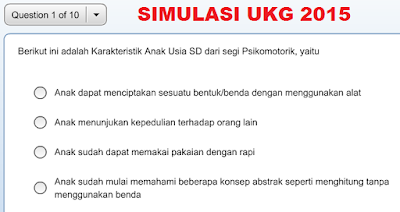 Some of us may still not have a clue how about the way to take the test is especially UKG UKG 2015 test system is done by an online system through a computer or a laptop that has been provided Committee .